Koffee with Karan is all about being sassy and bold. Karan Johar the host of the show is known for his witty questions and elite conversations. Well, it is no new news that Bieber the Grammy award winner has arrived India and if we go with the recent buzzing news, Justin will be seen with Karan himself on his new season's talk show. Seeing the pop star in the most controversial show will surely bring buzz out of the bag. Justin Bieber has landed in India today at Mumbai and will appear on popular TV show Koffee with Karan. Justin Bieber, the Grammy Award-winning singer is here to carry out his performance live in Mumbai at the JIO Justin Bieber Purpose World Tour on May 10 at the DY Patil Stadium. 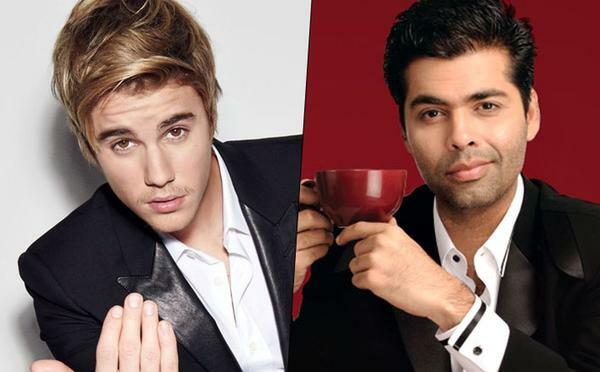 Though Bieber is on a tight schedule and will be in India just for the tour for his new album-Purpose, yet Karan is all prepped to bring the star in his KWK's new season as his first guest. If everything goes well with the plan then Justin will be seen sitting on Koffee with Karan sipping coffee and sharing the screen with the host Karan himself. “This will be the first time an international celebrity of Bieber’s caliber will be featuring in an Indian chat show format,” said a media source. Karan has done interactive chat show dialogues with international celebrities like Richard Gere, Maria Sharapova, Hugh Jackman and Christian Louboutin apart from working closely with Meryl Streep, Robert De Niro and George Clooney at world forum panels. “He will definitely Ado full justice to this one-on-one exchange if Bieber actually does decide to reserve a time slot for it in his busy schedule,” said the media head. We hope that we see the young pop sensation of the world sharing his thoughts and giving scandalous answers to our wittiest host Karan Johar. Bollywood Bleibers Added Glam to Justin Bieber's Concert in Mumbai. Jacqueline Fernandez plans to play host and guide to Justin Bieber!! !